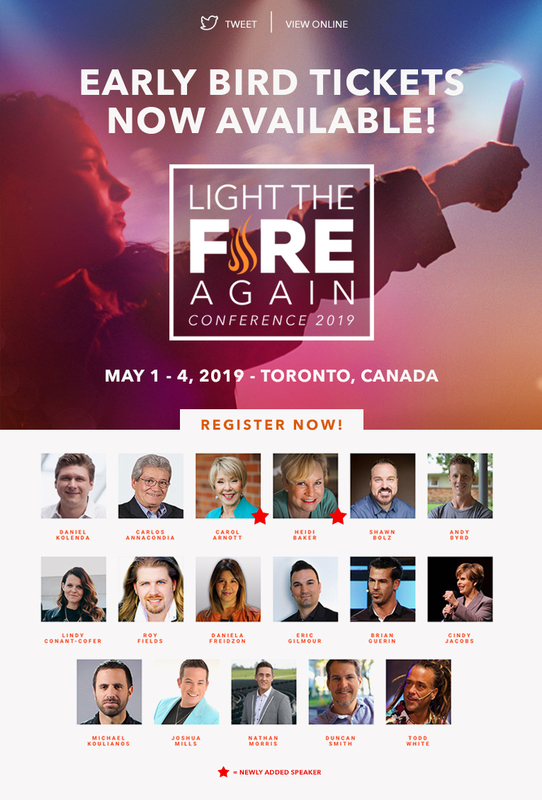 Come and join us for Light the Fire Again on May 1 – 4th, 2019 in Toronto, Canada! Hosted by Christ for All Nations. Daniel Kolenda, Carlos Annacondia, Shawn Bolz, Andy Byrd, Daniella Freidzon, Eric Gilmour, Brian Guerin, Cindy Jacobs, Michael Koulianos, Joshua Mills, Nathan Morris, Duncan Smith, Todd White, and with worship from Lindy Conant-Cofer and Roy Fields! We are believing for God to Rekindle the Flames of Revival and see a mighty move of His Holy Spirit sweep across the earth, stirring the hearts of this generation!